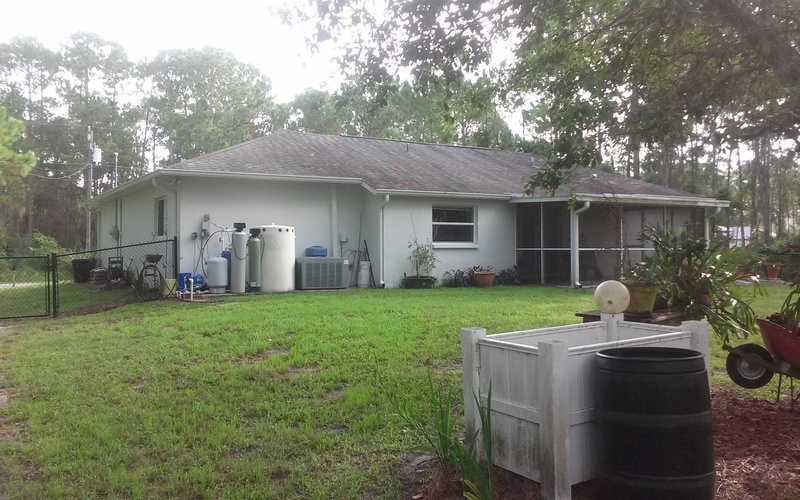 With Florida’s heavy rain seasons along with our high heat and humidity, it is a breeding ground for black mold, and over time will take over our asphalt shingle roofs. 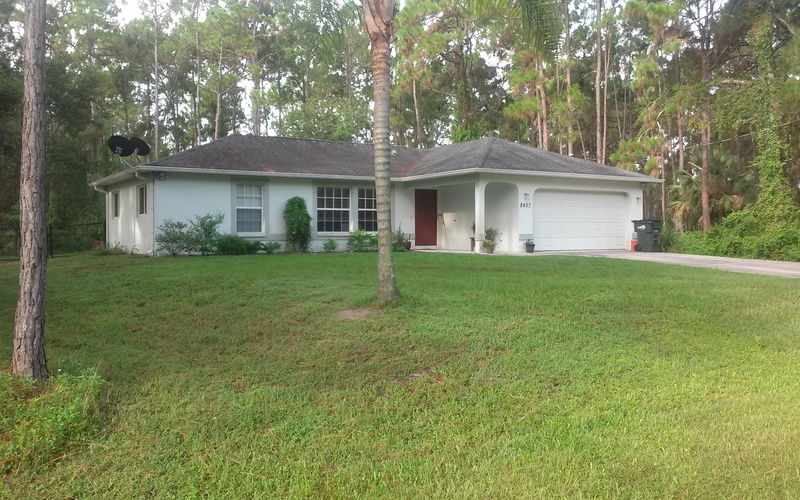 During my daily travels servicing other clients I see so many shingle roofs in Sarasota, Charlotte, and Manatee County that are neglected and infect with this roof mold. This roof mold known and classified as gleocapsa magma, feeds on the fillers shingle manufacturers use to compress the shingles and give them their light weight and strength. Once it has inhabited your shingle roof our heavy rain season will feed this micro mold organism and start to spread it further down your shingles. Even though this roof mold is not destructive or damaging to the shingle roof, it is an eye sore and creates a worn and dingy looking roof. What this roof mold does do to a shingle roof is prevent the shingles from reflecting the ultra violet rays produced from the sun, and will continue to slightly increase your heating and cooling costs from your air conditioning and heating units. Here at A-1 Pressure Washing we safely clean and remove the black mold streaks by following the manufacturers guidelines, and we do not use a power washer/ pressure cleaner to clean shingle roofs. 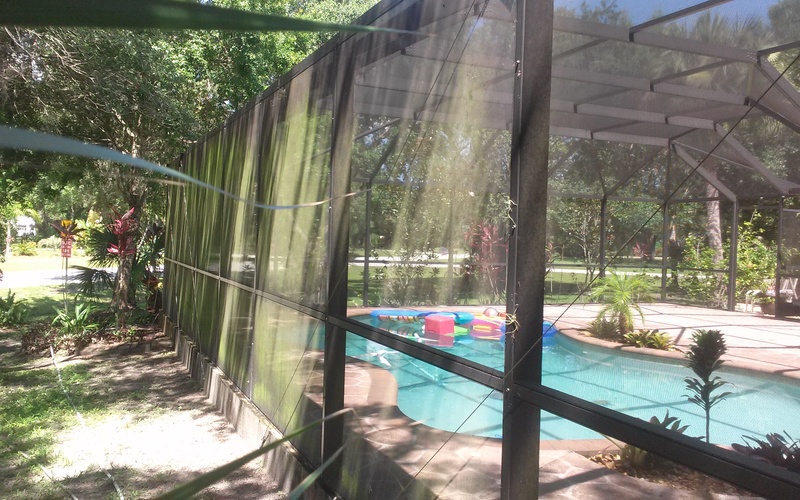 The manufactures recommend to ONLY use a soft wash chemical application to gently and safely remove the black streaks without damaging the granules on the surface of the shingles. Our certified safe no pressure roof cleaning system is guaranteed to remove all mold streaks and revive your shingle roof. Why do the Manufactures not want your to pressure clean your roof? Its actually very simple why the manufacturers do not want you to use a power/ pressure cleaner to clean your roof. When using a pressure cleaner you are relying on the high pressure and brute force to beat the mold off the roof. Which their studies showed this only removes the surface mold and pushes the mold spores deeper into the shingles, it also removes the granules and causes premature damages from the high powered water. This will also result in the mold returning within 6 months to a year, and you are forced to do it all over again. After several pressure cleanings on your shingles you will cause irreversible damages which could cause leaks and potentially have to replace your roof prematurely, which reroofs range between 10-30k depending on the size on your shingle roof. The ARMA (asphalt roofing manufacturers association) study also showed that 65% of Shingle Roofs are replaced due to the way they look, not because of their functionality. Half of the roofs ever replaced in the Midwest didn’t need replaced, only cleaned. 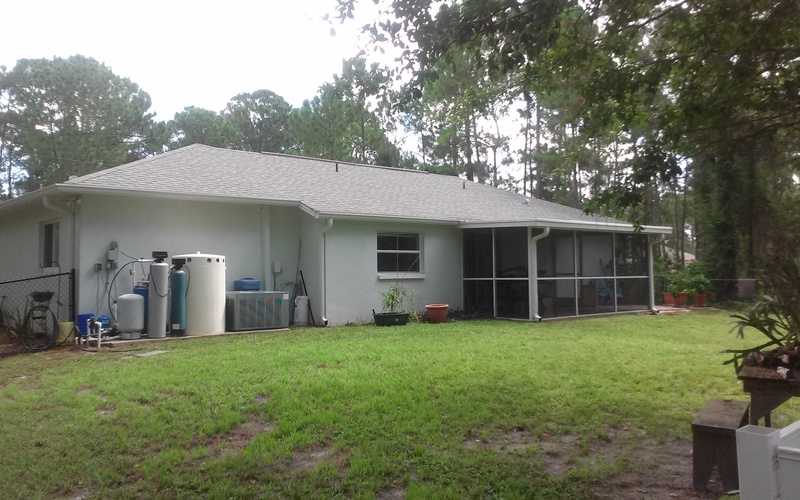 Just as mold and mildew can grow on your vinyl siding, this wind blown algae can land and grow on your roof causing black streaks and discoloration. Replacing your roof because of this algae is like replacing your TV because you lost the remote; it just doesn’t make sense? When our approved chemicals come in contact with mold, algae and bacteria it has a chemical reactions. It foams, turns white, and suffocates the mold and kills directly to the roots and removes the spores feeding inside the shingle. When the application has dried your roof is either 100% clean, or it is about 90% clean depending how thick the mold is, and if that’s the case we apply a 2nd coat to remove the remaining 10%. By following these procedures we are able to gently kill and remove all the mold which results in a clean roof that will last for years to come. 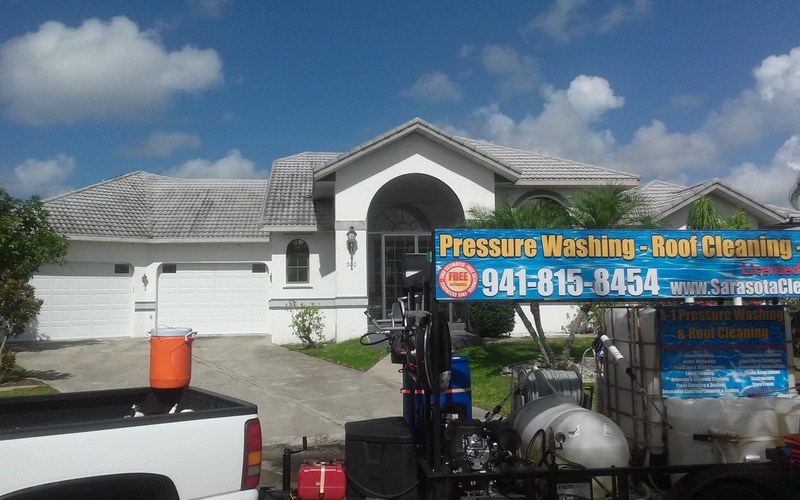 Here at A-1 Pressure Washing we take great pride in providing our customers with the highest quality of roof cleaning services. We also stand behind the manufactures guidelines and procedures, we provide a written 3 year mold free guaranteed to all our roof cleaning clients. If mold returns on your shingle roof before our 3 years warranty expires we will return and retreat any infected areas, its as simple as that. 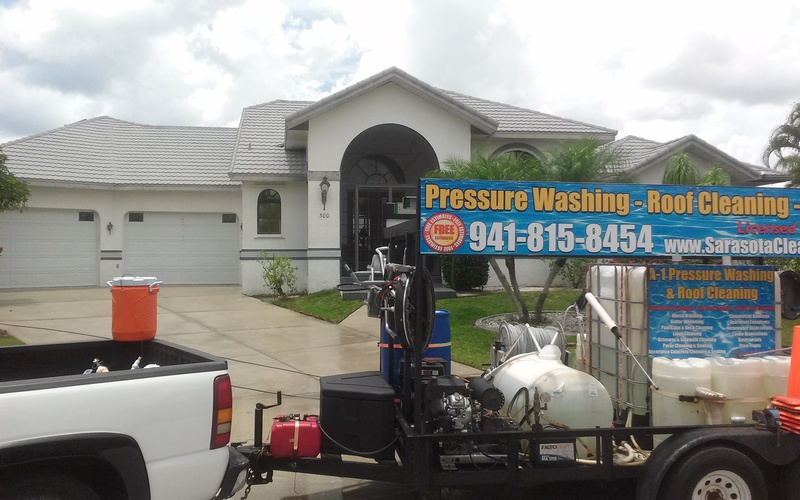 If your shingle roof in North Port, Venice, Englewood, Sarasota, Rotonda West, Port Charlotte, or Punta Gorda is infected and covered with black streaks, then please call A-1 Pressure Washing today for your free roof cleaning estimate. I will be glad to give you a free consultation and show you how we can gently clean your shingle roof. 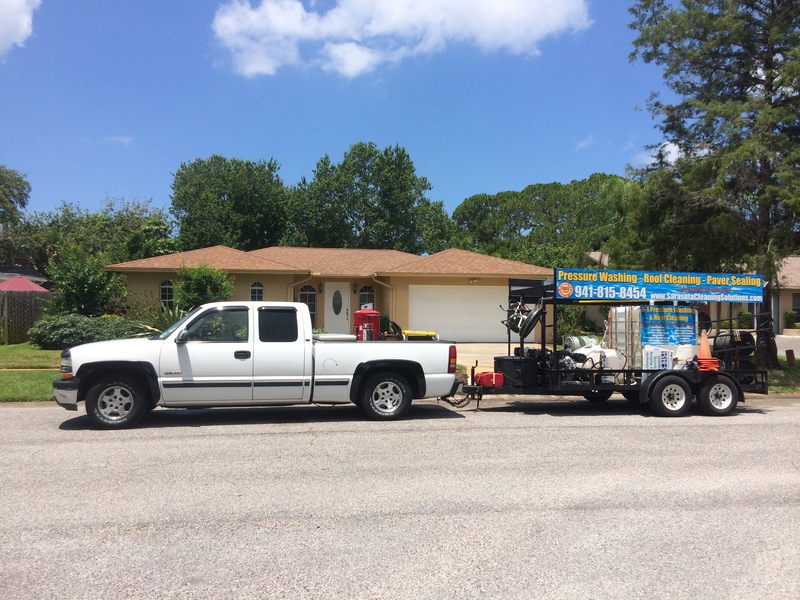 You can also visit our website and fill out our easy online roof cleaning estimate form at www.SarasotaCleaningSolutions.com. 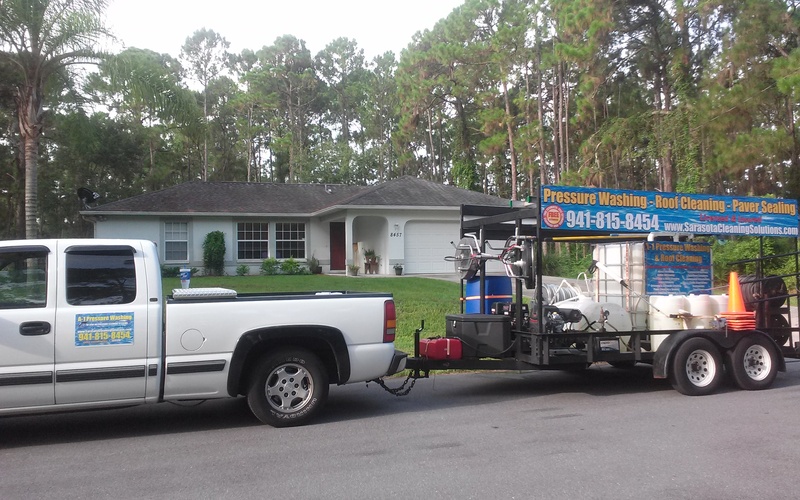 A-1 Pressure Washing offers Safe No Pressure Roof Cleaning Services to North Port, Venice, Englewood, Sarasota, Port Charlotte, and Punta Gorda. 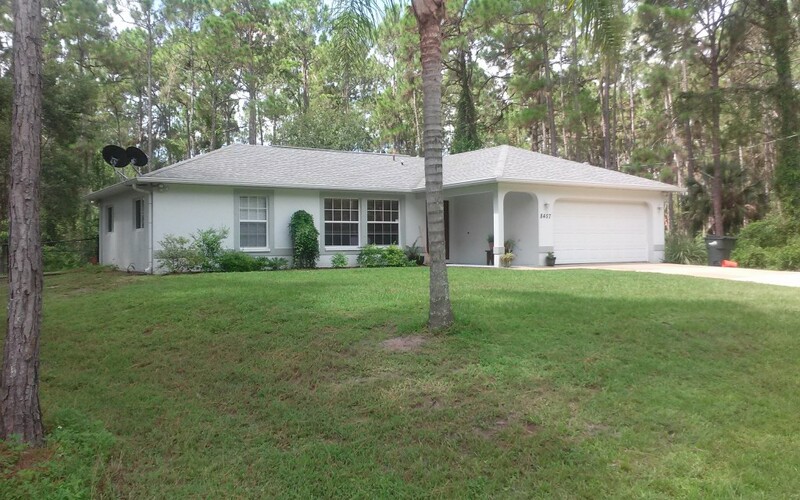 Proudly serving Sarasota, Charlotte, Manatee, and Lee counties since 1996. Please watch the video of our team cleaning this tile roof without having to use a high powered pressure cleaner. 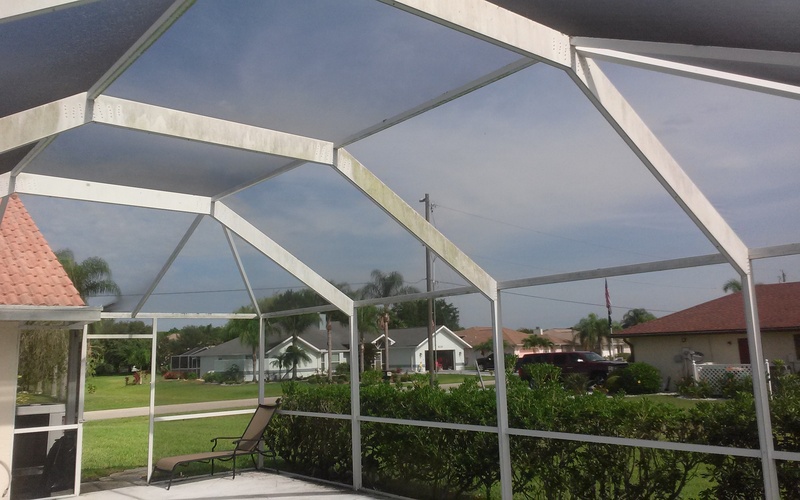 Don’t let other companies beat the mold off your roof with a pressure cleaner, call A-1 Pressure Washing and we will gently and safely remove those unsightly black streaks as recommended by the manufactures. Here we have a Decra Metal roof that is designed to imitate the look of a barrel tile roof. 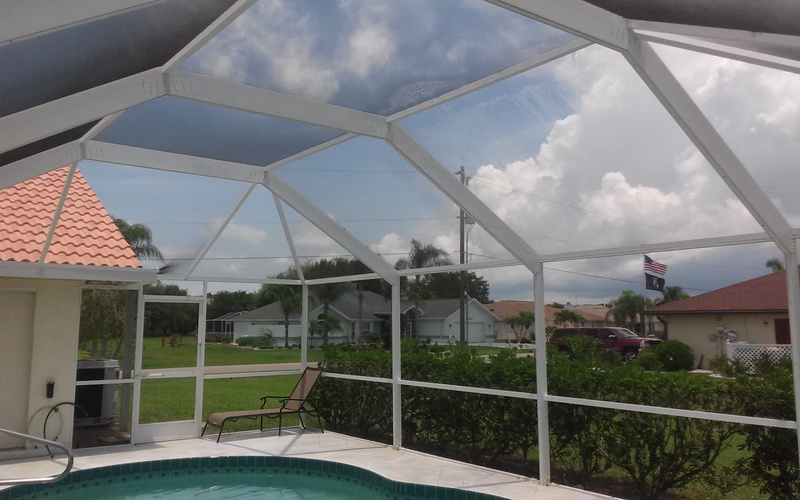 Ever since Hurricane Charlie in 2004 devastated many of the homes in Charlotte county, a good portion of the tile roofs were replaced with these metal roof because they offers the beauty and style of Mediterranean Barrel Tile, and the lightweight and durability components of stone coated steal. Much like a asphalt shingle roofs these Decra roofs are stone coated and have granules over the surface to add style, as well as protect the metal shingles. If cleaned using a high powered pressure washer it will damage the granules just like a asphalt shingle roof. Following Decras cleaning instructions we removed all the black mold covering this roof without using a pressure cleaner, and performed a chemical cleaning using our safe no pressure cleaning system. 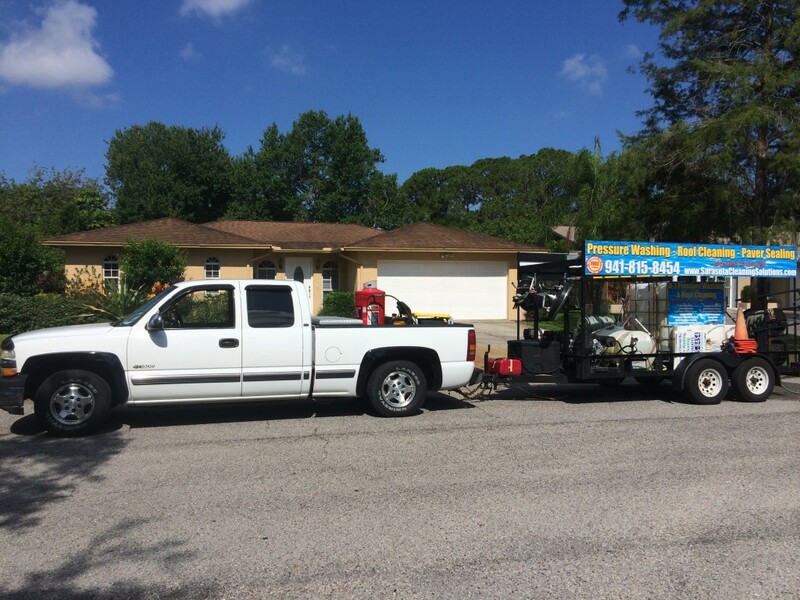 If you have a metal roof in Sarasota, Charlotte, or Manatee county that is in need of a professional cleaning please give us a call at 941-815-8454, or fill out our easy online estimate form at www.SarasotaCleaningSolutions.com. 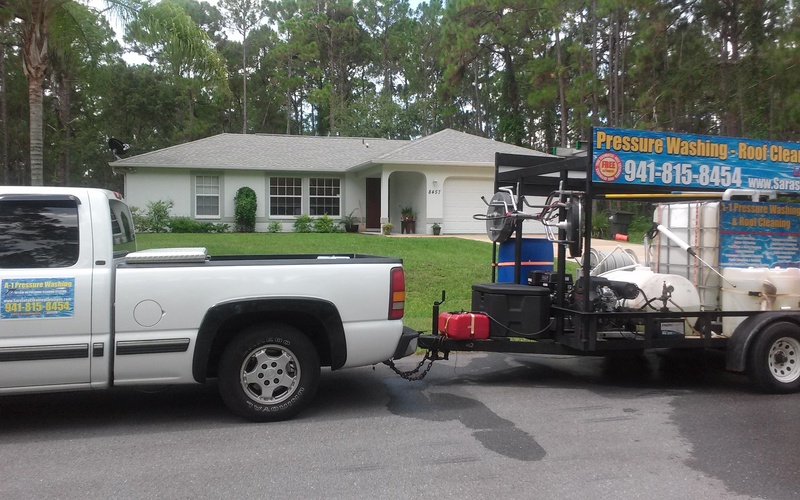 A-1 Pressure Washing is fully licensed and insured, my families company has been proudly serving Punta Gorda with professional pressure cleaning, safe no pressure roof cleaning services, and paver/ concrete sealing services since 1996. 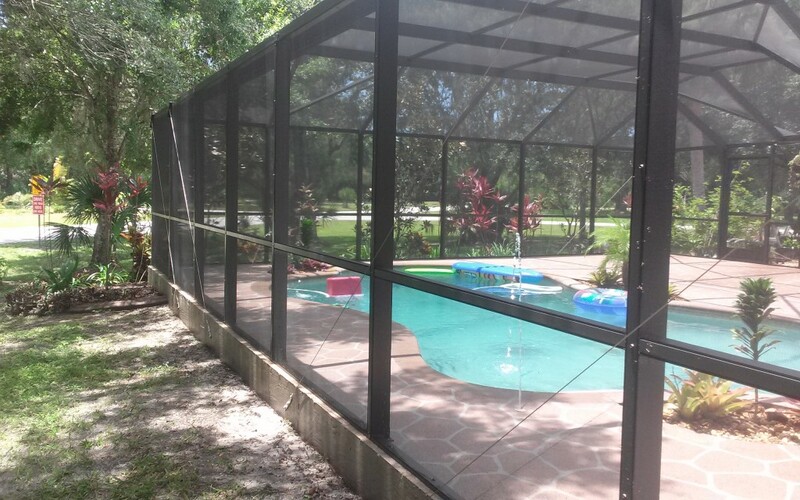 If you live or have a vacation home in Punta Gorda, FL and are in need of a professional team to help restore the exterior of your property then please give us a call at 941-815-8454 or fill out our easy online estimate form at PuntaGordaPressureWashingRoofCleaning.com.